Novalac Colic is a premium infant formula which has been specially formulated with a unique blend of ingredients to help relieve the symptoms of colic for formula fed babies. 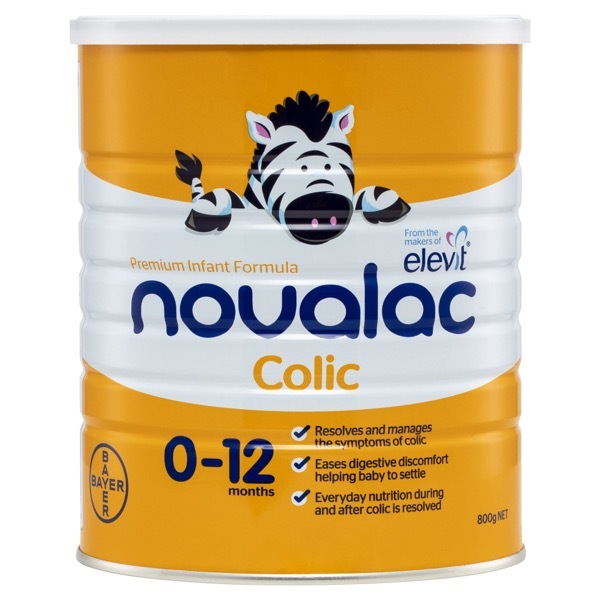 Novalac Colic is a premuim infant formula that has been specially formulated with a unique blend of ingredients to help reduce wind and abdominal discomfort in babies, assisting in comfortable digestion that will help settle your baby. For many babies, the bloating and wind associated with colic may be related to undigested lactose that remains in the gut after feeding. With reduced lactose and easily digestible carbohydrates, Novalac Colic prevents the build-up of gas in your baby’s gut that leads to tummy pain. Novalac Colic is nutritionally complete and suitable for ongoing everyday use after your baby’s colic has resolved. Follow instructions exactly. Prepare bottles and teats as directed. Do not exceed the proportions of powder except on medical advice. Incorrect preparation can make your baby really ill. Skimmed cow's milk, maltodextrins, vegetable oils (soy and palm), milk proteins, lactose, disodium phosphate, calcium citrate, tricalcium phosphate, vitamins ( A, D3, E, K1, B1, B2, B6, B12, C, Niacin, Biotin, Folic acid, Pantothenic acid ), di-potassium phosphate, emulsifier : soy lecithin, magnesium chloride, potassium chloride, choline bitartrate, taurine, potassium hydroxide, iron sulphate, inositol, zinc sulphate, anti-oxidant : tocopherols, L-Carnitine, potassium iodide, sodium selenite, copper sulphate, manganese sulphate.